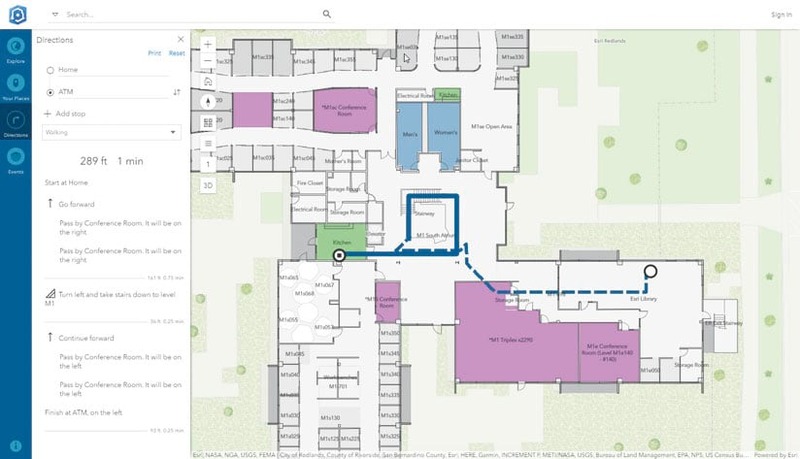 ArcGIS Indoors, a new indoor mapping system from Esri, gives business owners, executives, building administrators, and employees a common understanding of their interior spaces through an interactive workplace map. Many organizations still rely on disconnected email, paper and pen, and project files to carry out workplace planning and operations. But with Indoors, organizations can consolidate their indoor information—the people, places, and assets that make up a workplace—into a map that’s accessible and easy to use. With ArcGIS Indoors, organizations can consolidate their indoor information—people, places, assets, and services—into a workplace map that not only makes buildings more accessible but also renders them more secure. 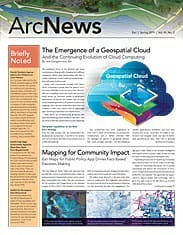 Indoors consists of three components: a desktop add-in for ArcGIS Pro, a web app for personal computers and/or touch-screen kiosks, and native mobile apps for iOS and Android. This complete system allows organizations to create, customize, share, and apply a workplace map for everyday operations. 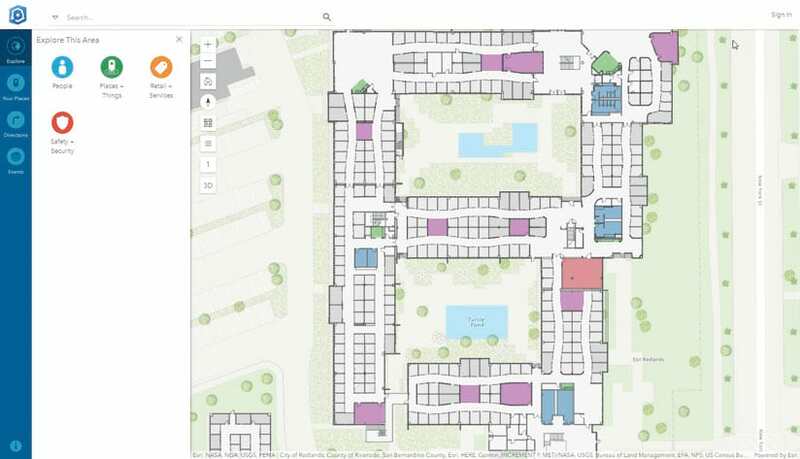 An organization can use the Indoors desktop add-in for ArcGIS Pro to consolidate its floor plans; CAD drawings; and information about assets, spaces, and people into the ArcGIS Indoors Information Model. This enables organizations to build a geodatabase of all their indoor information and use that to create a floor-aware workplace map that is viewable from the sitewide level down to the individual office level. It also allows for the creation of routable networks within the map, which employees and visitors can use to figure out where they need to be. The Indoors web app, accessible via an Internet browser or a kiosk, gives users the ability to share their location—fostering better collaboration with colleagues. They can also take advantage of indoor routing, which makes it easier to find various amenities within the workplace, including restrooms, kitchens, and bike racks. With a quick search function and the ability to explore categories such as people, safety and security, and services, users can locate what they need swiftly and efficiently in either 2D or 3D. Additionally, organizations can configure various levels of access to the workplace map so users see only what they need. For instance, the security department can use named user tracking to monitor and dispatch security personnel in the field so they can respond quickly to ongoing incidents and keep the workplace safe and secure. The mobile app lets users sync Indoors with their calendars, so when meeting or event reminders pop up, they can easily figure out where to go. The native iOS and Android mobile apps for Indoors expand the web app’s capabilities for use on the go. 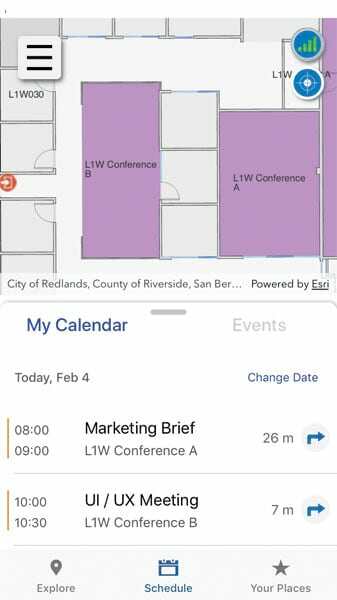 In addition to facilitating location sharing and routing, employees can sync the mobile app with their calendars, which is useful for finding and navigating to meeting areas, conference rooms, and other ideal spaces for connecting with colleagues. The mobile app is integrated with Survey123 for ArcGIS as well, so users can easily report workplace issues such as broken equipment or plumbing. This not only allows an organization to crowdsource indoor incident reports, but it also captures an issue’s exact location and creates a route to get there so the appropriate department can fix the problem efficiently. The complete Indoors system empowers all people within an organization to be comfortable in and connected to their workplace environment. With Indoors, organizations from all industries can capture and visualize indoor operations on a map to spatially enable planning, analyze and isolate bottlenecks, and increase throughput. All this makes it easier to administer a safer and more engaging environment, as well as save money and generate increased revenue. Using the full Indoors system, leaders of corporate buildings, state and local facilities, and academic campuses can also get a complete operating picture and better understand how to manage and allocate resources. Is space being properly utilized? Are workplace services being delivered quickly and efficiently? Is the identity and status of every single asset available and easy to access? These are the types of questions organizations can now answer strategically. The Indoors web app enables location sharing and routing. Users can view the maps in either 2D or 3D. Airports, for example, can use Indoors to bring together disparate datasets in one workplace map. This system of record enables them to streamline their operations, getting workers, assets, and people from point A to point B efficiently. With the higher levels of productivity that come with this, airport operations staff can ensure that travelers get through and on to their final destinations more quickly, pleasantly, and safely. The value that an easily accessible workplace map provides to an organization, its employees, and visitors is an optimized experience with, and a greater connection to, the built environment. This allows organizations to see, plan, and act more effectively, as well as better allocate and manage resources. They can advertise corporate events and help people figure out where they’re located on an indoor map. This boosts productivity; maximizes the value of the built environment; and saves time, effort, and money. So many organizations and industries will benefit considerably from implementing the Indoors system. Learn more about the technology.